Friday, March 8th, 2013 at 5:22pm. Last year, Omaha opened its second dog park. The first dog park opened at Hefflinger Park in west Omaha while the new dog park is located in midtown Omaha at Hanscom Park. The Omaha Dog Park Advocates created a website dedicated to the parks. 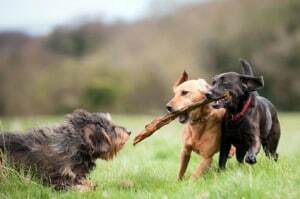 If you've never taken your dog to a dog park, then visit the website for a bunch of great information on dog park etiquette.